One of the many things I liked about living in San Diego. Comments Off on Annual Festival of Sail begins tomorrow! I was always thought that Captain Cook was killed by the Hawaiians because he mistreated them (that is what I was always taught), thinking they were inferior to Europeans. Then, years later, I began to read the diaries and journals of Captain Cook and many of the men who were part of his three expeditions. There have been many misunderstandings on both sides, however, Captain Cook treated the natives he encountered with respect, and received their chiefs with respect and honor. It appears that the natives liked Captain Cook, and he them. When Captain Cook left the Hawaiian Islands, for what he thought was the last time, there was an exchange of honor and ceremonies between the Hawaiian King Kamehameha. Soon after leaving safe harbor, the ships were caught in a gale and the foremast of the HMS Resolution was broken. Upon their return, Captain Cook received King Kamehameha with an exchange of gifts and honors, shortly afterwards several of the Hawaiian chiefs also boarded the ships for an exchange of gifts and honors. While in harbor on several occasions, there were thefts of metal objects by the natives. These events usually resulted in marines and sailors going ashore to retrieve the items. A Hawaiian chief would meet them on the beach, and find out what was the problem. The chief would them retrieve the items, sometimes bringing back items that had been stolen but not yet missing by the sailors. 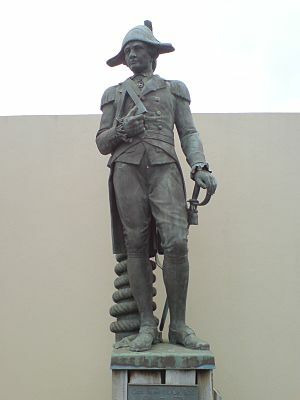 On one of these trips, Captain Cook accompanied his men. There was a crowd of natives around Cook and his men. Cook asked one of the chiefs to go back to his ship with him and the chief agreed. The crowd seemed hostile and he wanted to leave the area. When they arrived at the beach many of the natives decided they did not want the chief to go with Captain Cook. The chief acquiesced to their desires, but appeared upset at not going with Captain Cook. When Captain Cook was the last man still ashore one of the natives walked up behind him stabbing and hitting him with a rock. 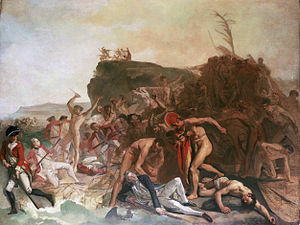 The men left Captain Cook’s body ashore. 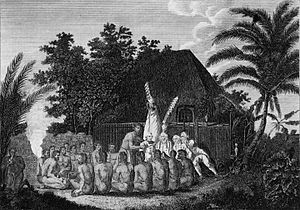 When they returned for Captain Cook’s body, they found the natives had removed his internal organs and baked his body to remove the flesh and preserve his bones. The Englishmen (in every written account from the time) were appalled by this and found it barbaric. They were able to get the king to return to them some of the remains of Captain Cook, which they buried at sea. When I looked at this, I realized that the Hawaiians, far from being barbaric, were honoring Captain Cook and had prepared his body as they did their own Hawaiian kings. In some respects, it reminded me of the Egyptians. King Kamehameha and his chiefs were a moderately influence on the Englishmen and the natives, frequently stepping between the two groups and resolving an issues that appeared. I have condensed the events surrounding Captain Cook’s death in this article. However, when I was researching this, I wrote down what happened systematically so I could analyze the events. I tried to look at the events from the side of the English, the natives, and finally from the standpoint of a neutral observer. What I discovered was considerable misunderstandings on the part of the English, natives, and some historians. History is not dates and places, or events that happened between faceless groups of people. History is the real life of living breathing human beings. Often, as in our own lives, there are misunderstandings and miscommunications, which can have disastrous consequences to those individuals. Consequences that both parties would have liked to have avoided. 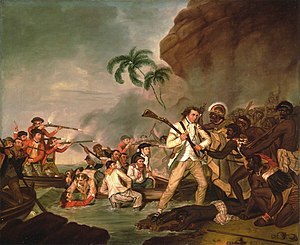 This was the case in the death of Captain Cook. As always, I invite you to research the written accounts of the day, and arrive at your own conclusions. We can learn something from Captain Cook and his death. Even when we treat others with respect, it is no guarantee we will avoid disaster. 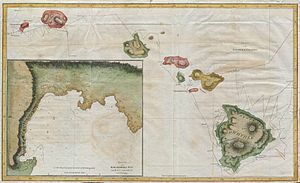 Captain Cook chose to retreat, but waited too long, perhaps relying too much on the respect the English and natives had for himself, the chiefs and King Kamehameha. As a participant in the events, he also may not have realized the grave misunderstandings that existed that morning between the two groups of men. The end result was the death of Captain Cook. When I started my blog, I intended to devote myself to writing about historical events and people. Over time, I received mail from people saying they enjoyed my articles, and that the articles distracted them from their troubles, if only for a few minutes. Troubles we have all faced to one degree or another through the weak global economy of the last ten years, and recession of the last five years. This was when I started to include other topics in my writings in an attempt to help as much as I can. Today’s article is in that vein. It is also very personal, but if it helps just one of you or someone you know, then it is worth it. On Monday July 22, I walked into the plant medical department at work (my night job) asking for aspirin. I had been feeling bad since Friday afternoon. After a few questions and quick examination, I was rushed to the hospital and admitted to the intensive care unit. The doctors had determined that Friday afternoon I had a mild stroke. There are signs that someone is having a stroke and I will share those with you at the end. However, I spent eight hours working around dozens of people on Friday without displaying any of those signs to anyone else’s observations or my own. I had a bad headache by my right temple which spread out to the rest of the right side of my head (I rarely get headaches), but that was all. A headache I had for the entire weekend, something that never happens. I was examined by three doctors (one a neurosurgeon), had blood draws every three hours, endured sonograms to observe my heart and arteries, endured CAT scans and MRI’s. 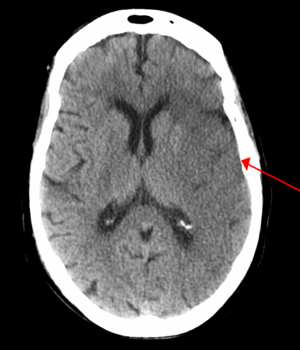 The doctors expected to find a physical problem, which would explain the stroke. What the doctors found was that I was in excellent health, particularly for a man 50 years old. (I thoroughly enjoyed the looked of confusion at my apparent excellent physical condition hehehe – I know this is not a laughing matter, but it is nice to be in better shape than the doctors anticipate). My heart and arteries are working perfectly, no blockages, weaknesses, or leakage. My cholesterol levels are fine. My blood pressure, high when admitted, returned to 120/80 which the doctors said was very good (normally I am 110/70). Their conclusion was that the only risk I had is the half pack of cigarettes I smoke a day. Then we set down for a conversation. This is when the doctors discovered the cause of my stroke. Stress. You see some of the problems that some of you have shared with me in your private letters, I am also having. With our recent economy, I have (as many of you are having) several serious issues that all need addressed immediately. Some of the issues have only been made worse by the actions of our politicians, and often those government agencies which claim to offer help are time consuming and in the end offer no help. I will prevail with hard work and attention to detail, and now (on advice from my doctors) taking time to clear my mind from time to time by stepping back to enjoy a pleasant moment without thought to those things I need to do. The final word of the doctors is that I have a slight weaknesses on my left side, which should be gone in 2 to 6 weeks. I did not notice the weakness, but each doctor discovered it independently of the other two doctors. They also told me that 80% of the effects of a stroke are reversed in the first 24 hours. When I got home Friday night, I took some children’s aspirin I keep in the house for my daughter. 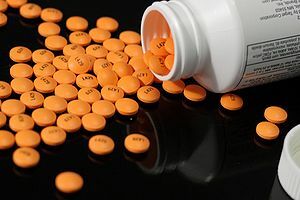 I do not use any kind of drugs myself and children’s aspirin for my daughter was all I had in the house. The doctors said the aspirin definitely helped me with the stroke. So, in about 2 to 6 weeks I will be completely recovered with no lasting effects. Very lucky indeed. The doctor’s also said that if I do not follow their advice about relaxing from time to time I will most likely have another stroke and I will not be so fortunate the next time. As I said, I did not display any of these symptoms, though I was having an unusual headache. Physically I am in better shape than even I knew, as well. The cause in my case was pure and simple … stress. Stress is a killer. As my doctors found out, there was no physical cause for my stroke. If you or someone you know is having ANY of these signs or symptoms, seek medical help immediately. If you are having an unusual physical problem (like my long and unusual headache) … seek medical help immediately. Do not wait. If my stroke had been more serious, the three days I waited to seek medical help would have been too late. I was lucky this one time. Do not count on luck. A stoke can strike anyone at any time, no matter how good or how bad your health may be. Slob to professional athlete, no one is immune. DO NOT WAIT TO SEEK MEDICAL HELP.